ACE also allows you to send feedback or report problems while you are browsing, using forms that are directly embedded in the interface. You can report problems using our contact form. From any page in the portal, you can click the Contact link available in the top right-hand corner. Clicking this link will bring you to a form for reporting your problem or leaving any comments.If you have a problem with a specific book, please ensure that the Include referring URL box is checked so that we can easily find the book. If you would like a response, please enter your e-mail address where indicated so we can follow up with you about the issue. If you prefer to remain totally anonymous, you may leave this field blank. 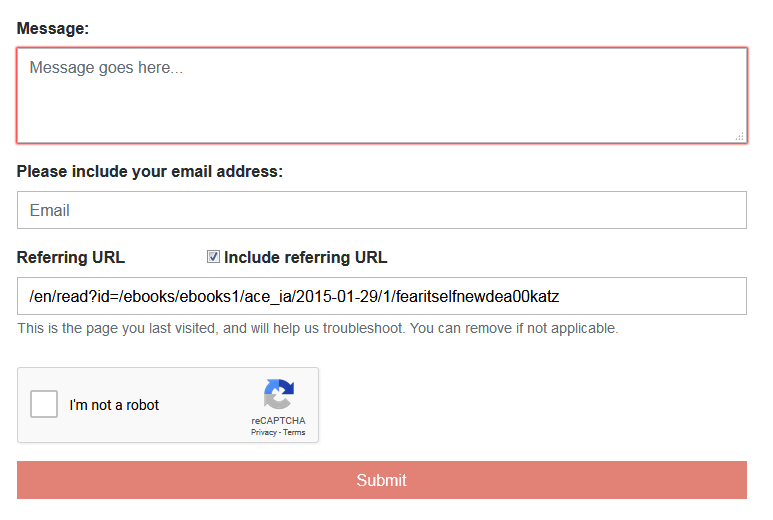 You can send anonymous feedback using a form that is embedded directly in ACE. When you are looking at any book in the portal, simply scroll down to the bottom of the page to find the feedback form. The feedback form prompts you to Please rate your experience using and navigating the accessible texts collection. There are three short multiple choice questions, and one open-ended question. None of them are required, so simply answer whichever questions you feel are relevant. No identifying information is captured, so your responses are anonymous. Please note: this feedback form is not embedded on pages with search results, only on pages with individual books.